1/16 Taigen 360 Turret Rotation Kit for IR Tanks Discounts Apply ! TAG120628 - 1/16 Taigen 360 Turret Rotation Kit for IR Tanks. Introducing the all new 360 degree turret rotation kits from Taigen Tanks! This item package will allow your turret to rotate 360 degrees with no limitations on turns compared to the stock 320 degree rotation limits on stock tanks. 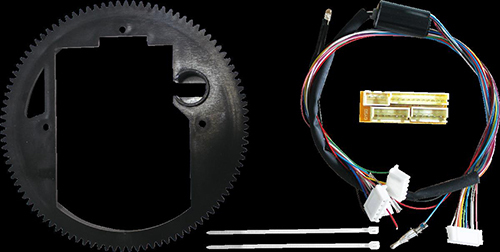 This kit includes a new turret gear ring, a slip ring, pass-through board (for turret), and some zip ties for wire maintenance. Please note, this item is the machine gun version. NOTE: Some tanks may require some modifications to plugs or wires during install. Turret gear ring is not compatible with Taigen King Tiger 9TAG13005/TAG13006).